Spring is in the air, and you know what that means: Cheap PC games. 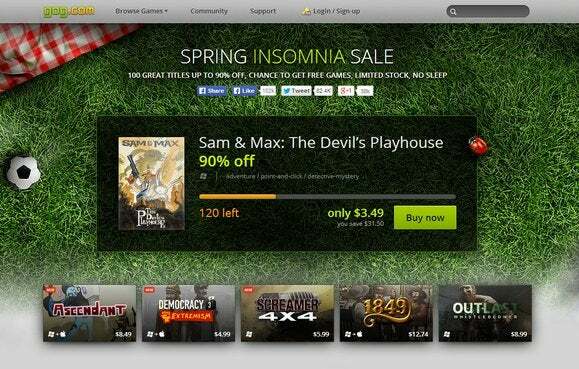 While we've yet to see a Steam sale this year—what gives, Valve?—two top PC stores are dishing out deals left and right, in the form of GOG.com's Spring Insomnia Sale and the Humble Store's Spring Sale. GOG.com's sale started Monday, and it's the more intriguing of the two. Mirroring last year's popular Fall Insomnia Sale, the spring variant is a mash-up of cheap games and Woot.com's Woot Offs. The site's putting 100 games up for sale at up to 90 percent off MSRP, in limited quantities. But only one game's available at any given time; all of the sale copies need to sell before GOG.com moves on to the next game, with a counter ticking down how many are left on the proverbial table. Watching the counter shrink ever-closer to zero, with the promise of a new discount right around the corner, is highly addictive, to say the least. Most deals speed by, and when they're gone, they're gone. As if that wasn't incentive enough to keep checking back in, GOG promised to give away a free game during the Spring Insomnia Sale—but it's not saying when. Meanwhile, the Humble Store's Spring Sale is more traditional, with a fresh slate of deeply-discounted games appearing every day at 1 P.M. Eastern/10 A.M. Pacific Time. The Humble Store's sale has been going on since May 6, but continues through the 21st. Don't expect to find the latest triple-A titles in these sales, but do expect to find a slew of more secretive gems. 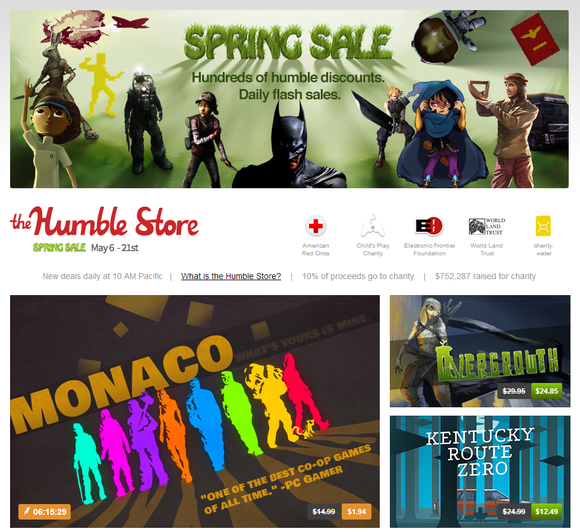 The Humble Store mostly deals in indie games, while GOG.com focuses on classic games with a dash of indies mixed in. Each store has another unique selling point, too: Humble gives 10 percent of proceeds to charity, while GOG.com only sells DRM-free games, often bundled with bonus goodies like soundtracks, wallpapers, and PDF manuals. What both stores have in common is that they're offering steep discounts on stellar games right now. Here's hoping your credit card has a daily spending limit.